It was a Friday in April, 2016, when Annie Howard got the news. The Adrian art teacher expected the ultrasound at a Toledo hospital would confirm an issue with the umbilical cord in her 24-week pregnancy. Instead she struggled to process a deluge of information about the fetus: Absent nasal bone. Calcium spot on the heart. Thick nuchal fold on the back of the neck. Two heart conditions. Adrian art teacher Annie Howard and daughter Hazel received vital support from members and leaders in her local association. The day after getting the news on that Friday in Toledo, Howard’s friend invited her to go picking for beach glass at a Lake Erie beach. Scouring the sand in silence, her friend yards ahead, she was overcome with emotion and sat down on a log to cry. She jokes that she and her husband are “the Slowskis”—taking their time and deliberating about everything. They dated more than eight years before marrying, and they waited another nine years before having a child to make sure they were financially set to raise a family. She quips that her husband now calls her “the old gray mare” and then breaks into lyrics from the song—“The old gray mare just ain’t what she used to be…”—followed by more giggles. In truth the past year has been a gravely serious time for the 36-year-old and her husband, Chris, a Truancy Prevention Specialist at the Lenawee Intermediate School District—but support from her union helped to lessen the weight of heavy challenges. After her premature birth, tiny Hazel stayed two months in the Neonatal Intensive Care Unit with tubes helping her eat, breathe, ingest medications, and fight off illness. When she came home, the family awaited three possible surgeries—including an open heart procedure—while keeping Hazel isolated from the world to protect her from infections that would be life-threatening. Because her heart condition made her fragile, the baby couldn’t go out—not to daycare, church or the grocery store. And Howard realized she not only couldn’t go back to work as planned in November—she didn’t even have a timeline to return. Doctors said they might need to wait two or three years to perform the riskiest operation. She debated options with the help of AEA’s Condon and his knowledge of the Adrian teachers’ contract. Howard had saved enough sick days to take off work through February. She had to retain health insurance. 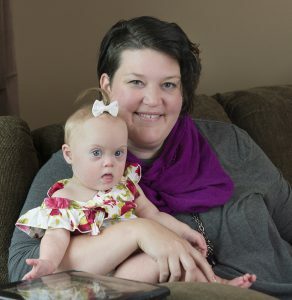 She couldn’t apply for a disability leave, because the medical issue wasn’t hers. She didn’t know how long she might need to stay home. “There were so many questions that I couldn’t answer,” she said. That’s when Condon and two of her friends stepped in. Knowing she would find it difficult to ask for help herself, they solicited sick day donations on Howard’s behalf from AEA members—many of whom know and love her, since she’s worked in every building in the district. She needed 67 days to stay home for the school year with full pay and benefits. Within two days of the request going out, 76 days were donated and more were turned away. Many of those members gave up summer cash payments they could have received for not using the days. Sick day donations are not entirely unusual. Many local bargaining teams have negotiated into their contracts some form of sick day banks, administered by local union leaders, where members can give to each other in moments of need. The Howard family turned a corner in March after doctors determined it was safe for Hazel to undergo the risky open heart surgery to repair a congenital heart defect—and the procedure was successful, leaving only about a three-inch scar on her chest. A second surgery to repair a gastric problem in May also went smoothly. Hazel is now fed via a gastronomy tube (G-tube) inserted through her abdomen, rather than a nose tube. The G-tube will remain until she starts eating on her own in the next year or two. Immediately her color improved, she became increasingly mobile and curious, and she was cleared to interact with the world—no more fear of germs and infection. In June, Hazel enjoyed her first camping trip, first swing in a baby swing, first playpen interaction with another baby. Like mother, like daughter. Throughout the Adrian education community, Howard is admired for her hard work and leadership and loved for her creativity and caring. In addition to her K-12 duties, Howard works as an adjunct instructor in the Adrian College Department of Art and Design and serves on the Executive Board of the Michigan Art Education Association. In the summer she helps to run an elementary day camp, Art Rocks Kids (ARK), connected to Adrian College. This fall she will return to work, teaching sixth-grade and high school art classes and serving as the district’s arts coordinator, planning professional development, seeking grant money, and organizing events such as field trips. She’s the kind of teacher who lives her subject. A working mixed media artist herself, she said she loves to teach kids techniques but set them free to use them in personal ways that communicate their unique ideas.